Students from Missouri University of Science and Technology participate in many competitions, from solar houses to solar cars, from human-powered vehicles to vehicles made from unique materials. Take the concrete canoe, for example. Missouri S&T students have built a 250-pound canoe out of concrete and will prove that it floats during the American Society of Civil Engineers’ 2017 Mid-Continent Student Conference. 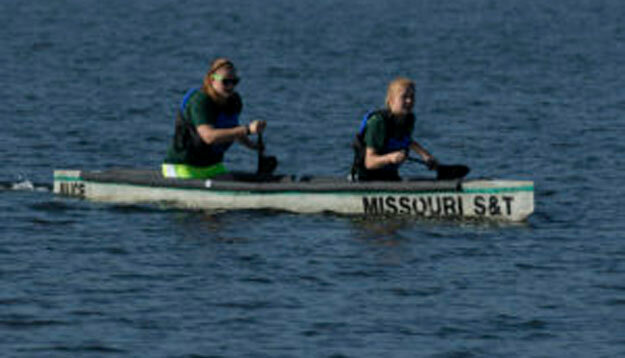 The Missouri S&T Concrete Canoe Design Team will showcase its canoe and compete against other regional universities at the conference, which will be held April 21-22, at the University of Arkansas in Fayetteville. For the competition, students must design a “lightweight” concrete canoe that can remain buoyant when completely submerged in water, is strong enough to hold several paddlers and can easily maneuver through the water. Read more about the concrete canoe, or follow the team on Facebook. RESULTS: The team performed well in competition and won four trophies: first in Women’s Sprint, first in Men’s Sprint, second in Women’s Endurance and second in Co-ed Sprint. Congratulations!